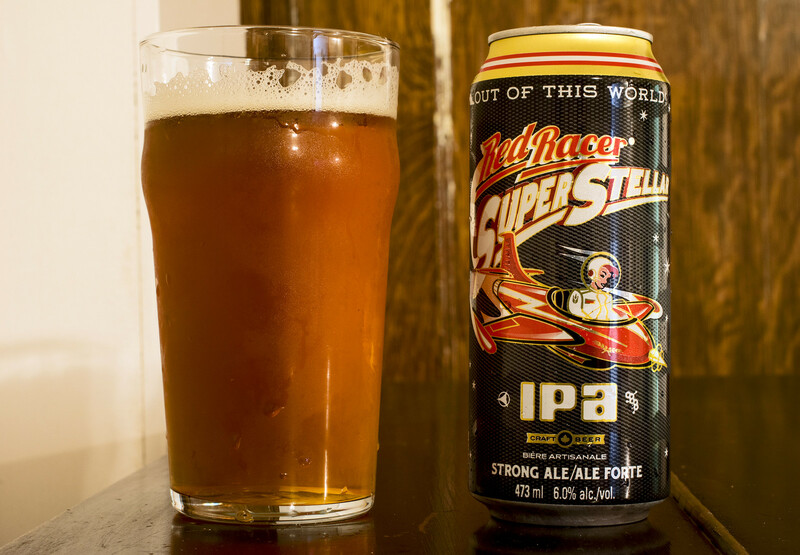 Appearance: Super Stellar pours a bright amber ale with a bit of a caramel hue, a slight amount of cloudiness. The foam is gushing up with a thick and frothy beige, but it gradually dissipates to nothing at all. Aroma: For the most part, I'm getting notes of pine, grapefruit, a strange bite of black pepper, mild notes of caramel malt and a hint of alfalfaesque floral notes from the hops. Pretty just out there as it is. Taste: Hmm.. the first impression I got from the beer is that it's giving off a bit of a woody characteristic, followed by a liberal amount of caramel malt sweetness, a light amount of grapefruit, a light soapy vibe on the palate which is actually.. quite usual for an IPA, and last off.. a bit of a metallic aftertaste. Overall Thoughts: Just your standard Red Racer Ale in the end, lots of flavours all over the place, but in the end of the day, it's not as good as the typical Red Racer IPA... but Red Racer disappears within moments of appearing in Manitoba.